At least half of the items in my closet were purchased secondhand from thrift and vintage stores. They had a life before they came to me, and in the case of some of the more unusual pieces, I am always curious about the previous owner - who was she? Where did she wear this? Did she love it? Unfortunately, in most cases, I'll never know who used to own the items I now enjoy wearing. 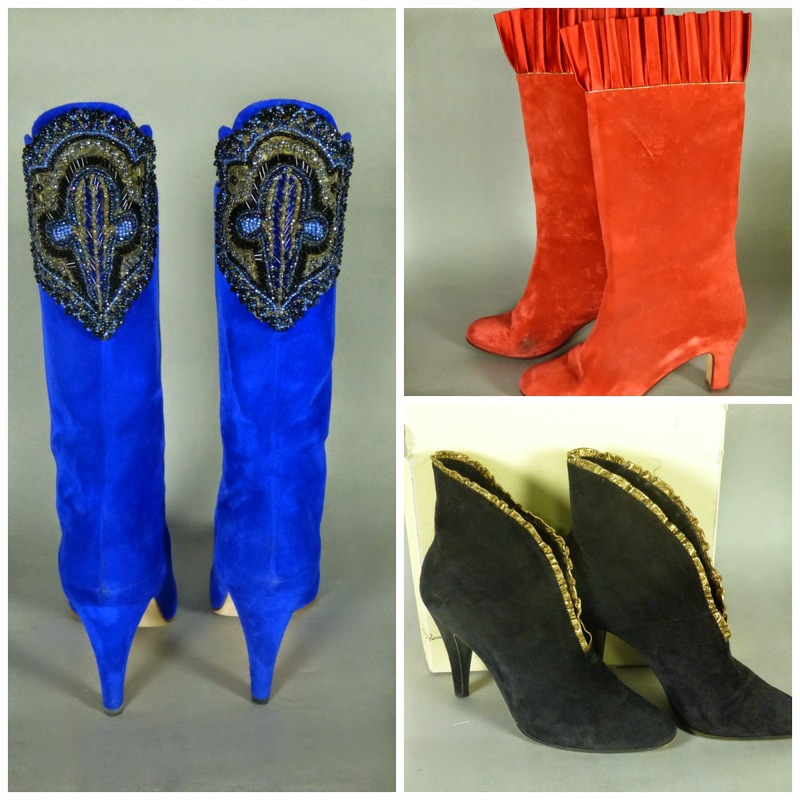 A few weeks ago a friend emailed me a link to an online "Vintage Couture" auction run by Gardner Galleries, our local auction house. 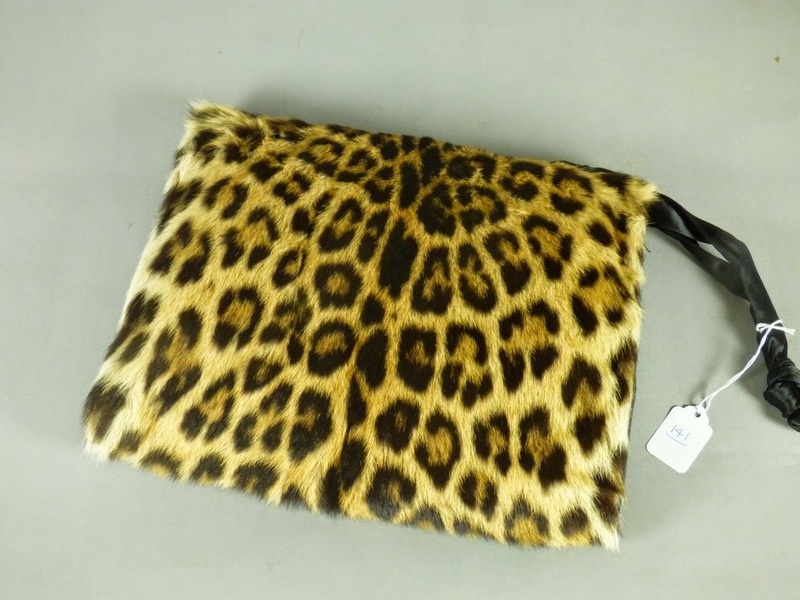 The auction featured clothing and accessories that belonged to Rachel Heyndrickx, who died in November, 2014 at the age of 93. Gardner's generally deals in furniture, household items and art so it was unusual for them to hold an auction specifically devoted to items in someone's wardrobe. I looked at the photos of the items up for bid on the website and was intrigued enough to attend the auction preview with a friend in order to see the items in person. I'm not a fan of bidding against other people for items I want and avoid Ebay for that reason, unless an item has a "Buy It Now" option. I have attended a couple of live auctions but would get very upset when other people bid on items I really wanted, especially when they were dealers. I couldn't wrap my head around the unfairness that whoever had the most money won. Once I saw the beautiful items that had belonged to Miss Heyndrickx, I decided to dip my toe in the auction waters again. According to her obituary, Rachel Heyndrickx's family was in the tobacco business, and she was the Office Manager at Imperial Tobacco. She was a world traveler who loved her garden, never married and had no children. What the obituary didn't say, but was obvious to me, was that she loved her clothes, and dressing up. This was confirmed by one of Heyndrickx's nieces who attended the preview, who told me her aunt travelled to Toronto and Montreal frequently to shop. 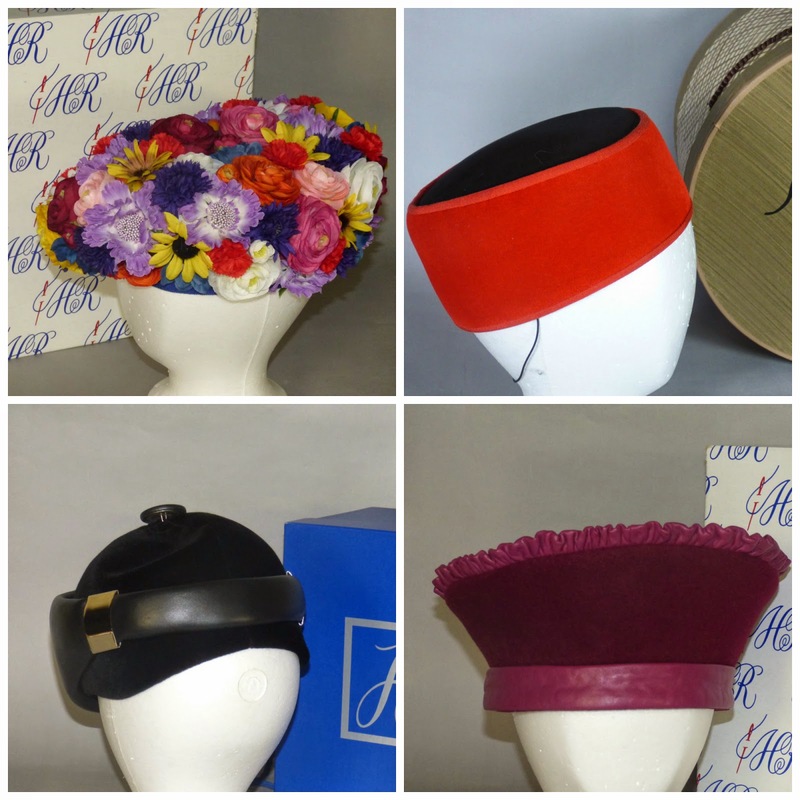 Many of the items in the auction were from Holt Renfrew, Creeds and Saks Fifth Avenue. She also had a good dressmaker as evidenced by the many custom made outfits in her closet. The niece's husband mentioned that Heyndrickx's home was like a museum, and that she would buy hats that didn't necessarily get worn, but because they were beautiful or interesting and she liked to look at them. It was obvious that Heyndrickx had very good taste - the clothing in the auction was simple and elegant in shape, and made of luxurious fabrics - silk, wool, silk velvet, fur and leather. She loved hats - not just simple, tasteful hats but wild, extravagant ones as well and she was obviously not afraid to stand out in a crowd. Her clothing and accessories had been carefully stored and cared for, as they were all in excellent condition. Heyndrickx particularly loved fur, as she had at least 6 high quality designer fur coats, many with matching hats. This leopard fur muff matched her mink-trimmed leopard fur coat. The furs drew a large number of bids. 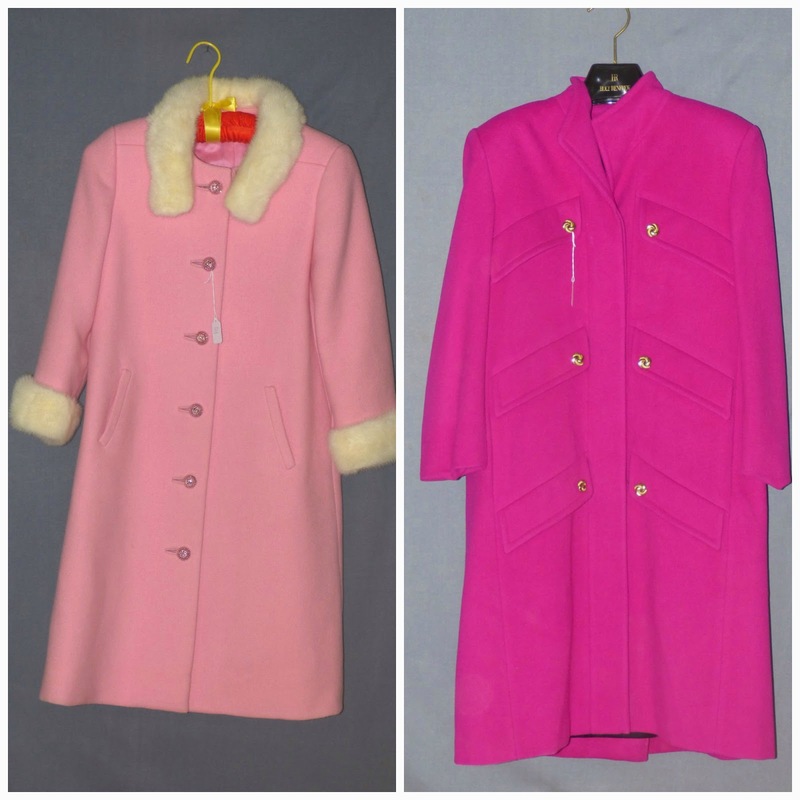 If the clothing in the auction was any indication, Heyndrickx loved colour; of the many coats in the auction, five were in various shades of pink. Yellow seemed to be a favourite as well. 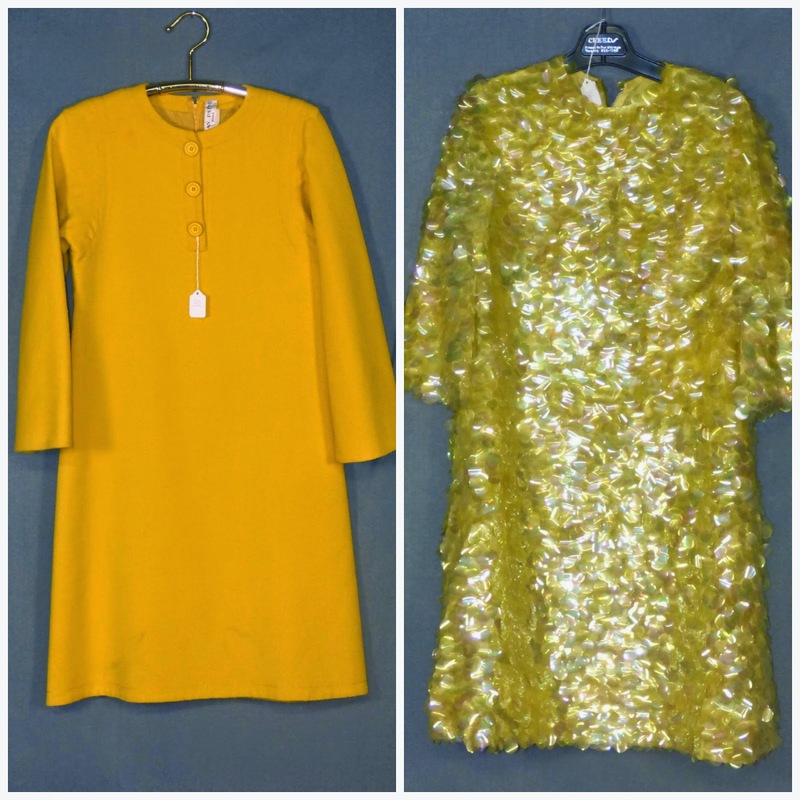 The dress on the left is by Jean Patou, and the paillette-covered dress on the right (described on the auction site as a "wild 60's dress) appeared to be handmade. Heyndrickx's wore the dress on the right to her niece's wedding, which confirmed the feeling I had that tea and a conversation with Miss Heyndrickx would be very entertaining. If I had to define Heyndrickx' style in a word, I would say she was very much a "lady" in the way she dressed. 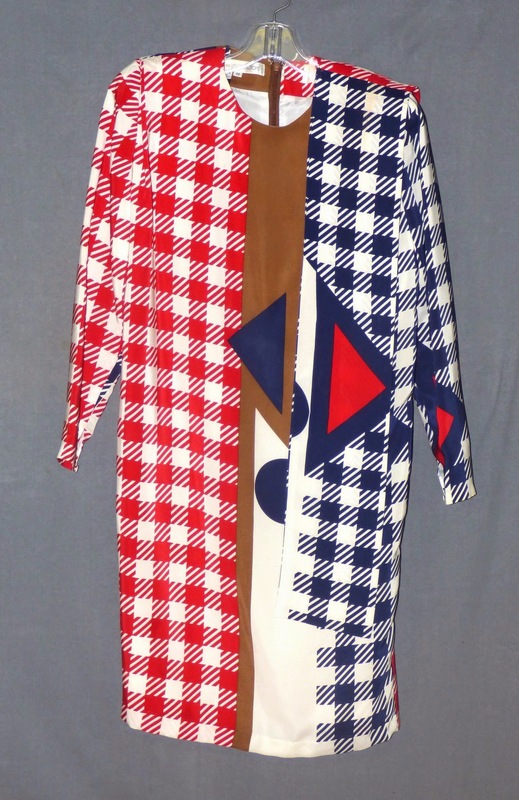 Of the items in the auction, many were elegant dresses with matching jackets or coats. Left: 1960's wool suit with chinchilla pompoms with the label "Ducharme, the World's Finest Fabrics, Paris" Right: silk dress and coat with matching lining from Holt Renfrew. 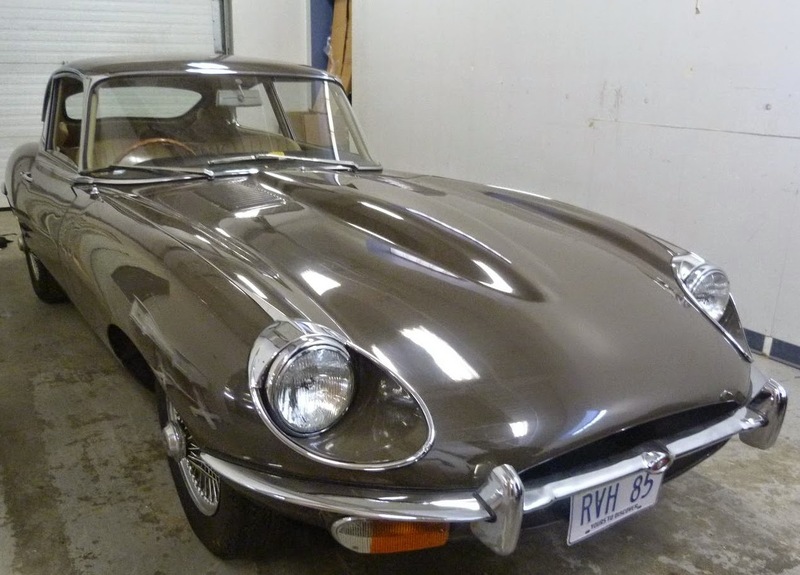 If any further proof was needed of Miss Heyndrickx' love of beautiful things, here is a photo of her 1970 Jaguar, kept in pristine condition and only driven in fine weather. It sold for over $100,000. 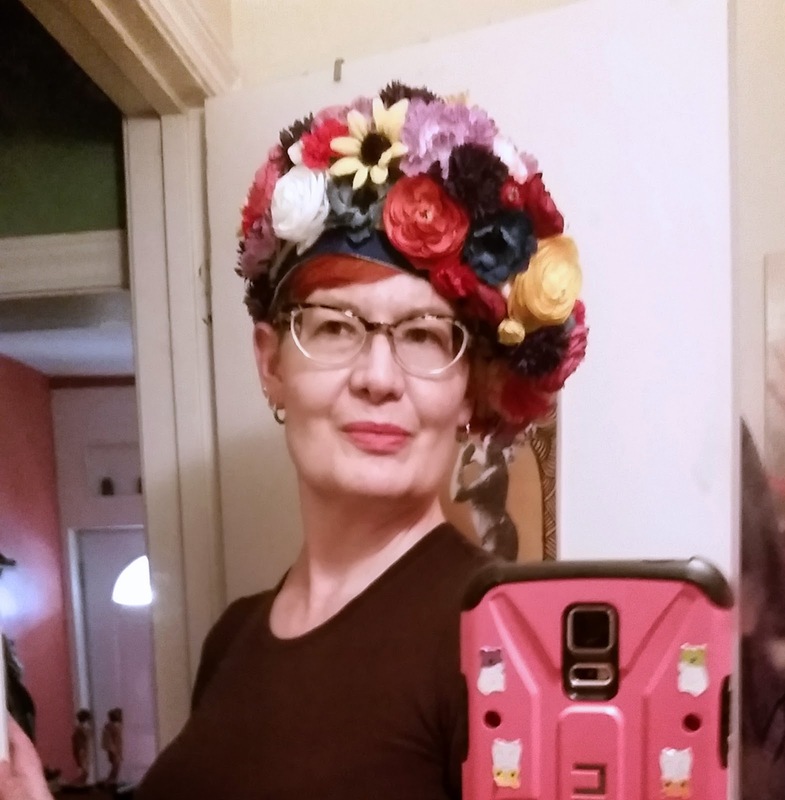 I tried on most of the hats at the preview and loved a great many of them, but the bids on most went higher than I was prepared to pay for yet another hat (even though they were still very reasonably priced). I made a last minute decision to bid on the flower-covered Kokin which was so over the top that it was more art than hat. When I was looking at the hats, I thought it would have been wonderful to have seen photos of her wearing them. The irony was that during the preview, a friend discovered a pile of photos of Heyndrickx, wearing some of the clothing in the auction, in a drawer of a dressing table that was part of the auction of her furniture that was happening the next day. When we looked for the photos the next day, sadly, they were gone. They would have been a marvelous addition to the display of her clothing and accessories and would have fostered a connection between the buyers and the former owner. 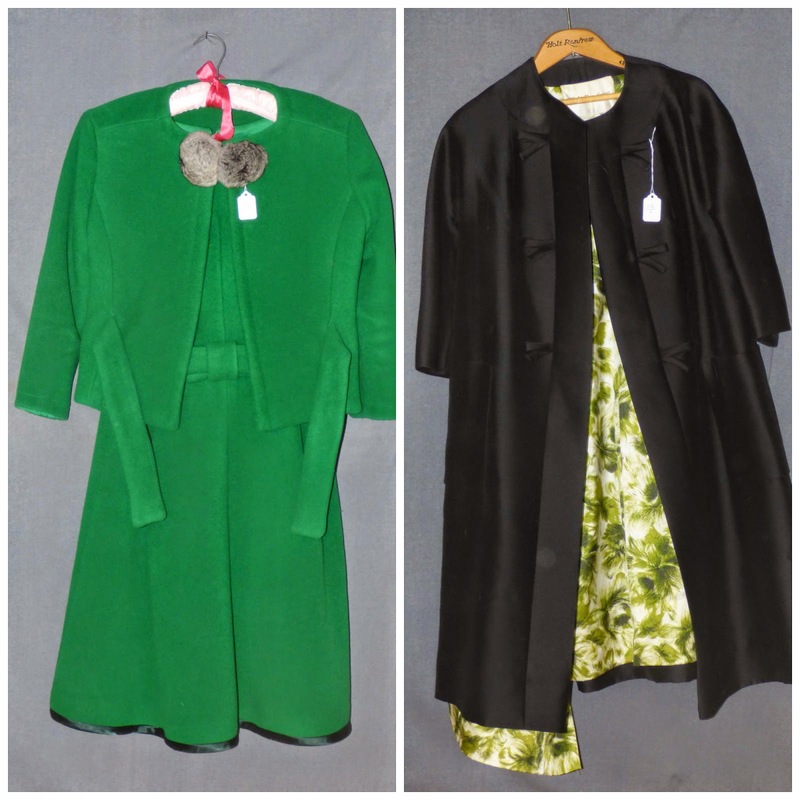 In addition to the "Garden for your Head" (my description, not the designer's), I won two coats, the 1980's one I'm wearing in the photo above, and a teal and black leather one which needs a button replaced. I thought I'd have to put them away until next winter, but with the cold temperatures and intermittent snow we've had this week, I was able to wear the pink one to work. It was made in Canada, something you rarely see these days, and I was warm, and very visible. I thought of Rachel Heyndrickx while wearing it, and hoped that she would have enjoyed seeing her clothing have another life with someone who appreciated her style, her love of dressing up, and her independent spirit. Here's to you, Rachel Heyndrickx, from one very visible woman to another - I wish I would have had an opportunity to meet you. Yes, that's an auction for ya - s/he with the most money wins. But you DID win! Fueled by passion for these unique pieces. Hurrah. 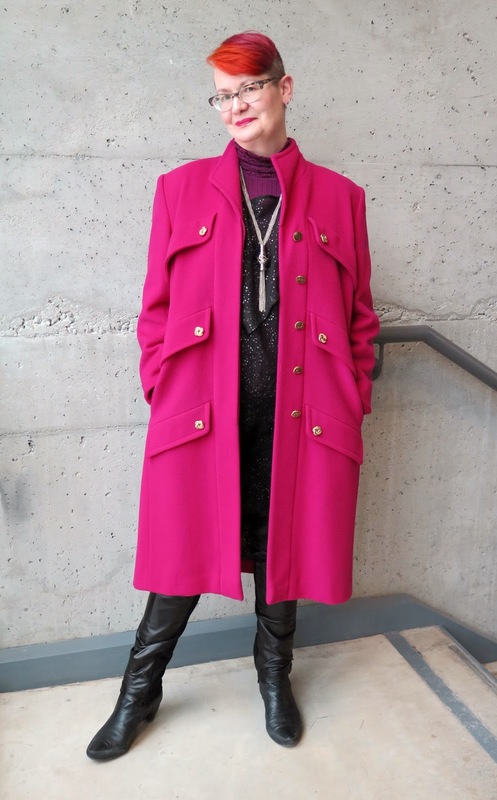 Fantastic hot pink coat. Dare I say it's lucky the weather turned colder so you could wear it...? And the garden on your head, tremendous. I agree; it's sad that the photos were not displayed to augment the items, but I think many buyers could care less who owned a piece and the anonymity might even be a comfort to them(!?). You are a sensitive soul so of course you want to know. I'm disappointed that you never met Rachel. I look forward to seeing the other pieces you got. Thank you for posting such amazing fashion eye candy! WOW, Shelley!!! I just love her and you both. Thank you for bringing Rachel Heyndrickx to life for us, dashing ensembles, classic Jag, and rumours of a fabulous life. Wonderful treasures you won, justice well done! LOVE the hat!!! Now THAT is visible baby! And it suits you to a tee! I'm kind of mad now that I didn't bid on anything. I was so tempted on some of those boots. The blue and red ones especially. I also find it more interesting to know about the people that owned the pieces before me. It makes the clothes take on another life. Have you ever been to Elora? There is a vintage shop called Sweet Trash (that I LOVE) and the owner, Terrie often used to type out a brief history of the previous owners. I was fascinated with it and it helped to fuel my interest in all things vintage. I haven't been to her shop in a while. I always spend too much there. What about that CAR! Wow! that coat looks wonderful on you! I love auctions, and I'm sad that the local auction house here has gone on-line only. Even if I come home empty handed, I love listening to the auctioneer. Wow Miss H sounds like she was awesome. I'm not usually a fan of auctions. I prefer buy it now, but I know auctions can yield some amazing deals if you have the patience. Great pink coat! I would finally learn how to drive for that Jag! It's gorgeous. Thanks for sharing the story of such a dynamic woman and you got some great pieces out of this auction too. What a lovely post, Shelley. Yes, I often think about who may have owned and worn my vintage clothes before me, and I love the odd occasion when I get to hear about their history. What a lovely post and an honor to Miss Heyndrickx's style, I'm sure she would have appreciated it. oh yes, as I saw the magenta coat, I thought 'please, tell me you've made a bid on it'! !, and I'm glad you did it!, it's a fabulous piece and a fabulous color! Love to know something about Miss Heyndrick's life and style, such an interesting woman, that makes me feel you're part of a certain sisterhood of fabulous ladies wearing pink coats and rocking!, love it!! You know I love that hat!!! Wow, what an awesomely eccentric and stylish dresser she was! I can only dream that someday my own collections will be revered and loved like that. I'm so glad you got a few pieces. That pink coat is divine and the floral hat is fabulous. I dislike auctions as well. Hi. I'm Cathy, another one of Rachel's nieces. She was definitely one fine lady. She would have loved all of this attention. She would always turn heads in Delhi, especially when she drove her Jag to church. She made all of the custom clothes herself. We loved her and miss her.